The women’s team falls to a .500 record on the season as it fell to the SUNY New Paltz Hawks at home this past Saturday. The November 25 matchup was the last game before the Lady Cardinals begin their Landmark conference play on the road against Drew. The last tune up before conference play did not fare well as the Cardinals dropped the matchup, 81-54. The matchup was the team’s worst home loss in 4 years since it dropped a 63-36 loss to Salisbury in the DuFour Center. The blowout loss was not all bad however, as junior guard Mollie Reynolds scored a career-high 15 points in the match up. She also added 5 rebounds, 5 assists, and 3 steals on only 2 turnovers for the night. 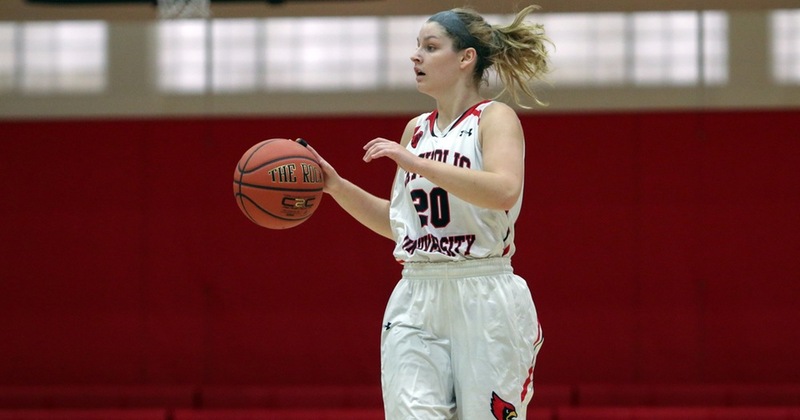 Senior guard Sarah O’Neill was the only other Cardinal to break double digits with 12 points. She also added 6 rebounds and a steal to her performance for the night. The Hawks dominated the game early, going on a 21-5 run in the final 8 minutes of the opening quarter to take a 23-9 lead. They would continue to build on this lead for rest of the first half of play to make the lead 30-16 with six minutes to play in the half. Catholic managed to go on a 16-7 run to close out the half down five, 37-32. This comeback would not be enough however, as New Paltz would take over the second half and outscore Catholic 21-8 in the fourth quarter. Despite Reynolds’ impressive performance, the team put on a terrible offensive display. The team only shot 32.8% from the field on 22-67 shooting. It also only shot 13.6% from beyond the arc on 22 attempts and only 43.8% from the free throw line, shooting 7-16. The team also turned the ball over 17 times. This game marks the first time Catholic had given up over 30 three-point attempts in a game since the 2016 Landmark Conference Championships at Scranton. The Hawks completely dominated the Cardinals from behind the three-point line, shooting 46.7% (14-of-30) on the night compared. New Paltz was the second team in the country in three-point shooting, 31 on 106 attempts in its past two games alone. Despite the loss Catholic looks to start strong as conference play begins hosting the Rangers of Drew University. Drew is 2-2 on the year but fell to the Cardinals by double digits both times the two teams faced off. The home game is set to tip off at 2:00 PM on Saturday, December 1 in the DuFour Center.